Facilitates achieving the top physical shape. 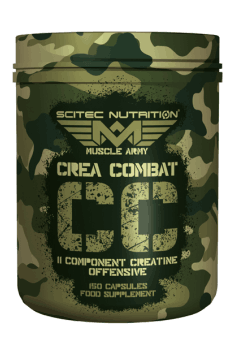 Scitec Crea Combat is a complex creatine stack containing a mixture of various forms of this substance, including micronized creatine monohydrate, creatine citrate, creatine phosphate, creatine pyruvate, and Kre-Alkalyn®. In addition, the preparation was enriched with Fenugreek extract, alpha-lipoic acid, alpha-ketoglutarate, l-leucine and the addition of niacin and folic acid. The beneficial properties of creatine as a substance improving the exercise parameters of people performing sports have been supported by solid scientific evidence. Creatine supplementation contributes to the more efficient functioning of the muscle apparatus, causing their strength and mass to increase. Creatine supplementation during high-intensity physical activity increases the body's ability to resynthesize the ATP that is the main carrier of the body's chemical energy. Creatine monohydrate is the simplest, one of the most effective and the most thoroughly studied form of this substance, the micronization of which improves its absorbability and efficiency of action. The preparation also contains creatine citrate, which is a combination of creatine and citrate which is a substance formed in the Krebs cycle and also involved in energy transformations. Creatine phosphate has been developed to improve the effects of the phosphagen pathway to obtain energy from the breakdown of creatine. Creatine in the form of pyruvate involved in energy transformations has a wide spectrum of activity and excellent solubility. Buffered alkaline creatine (Kre-Alkalyn®) to a lesser extent is converted into an inactive form (creatinine), and due to its resistance to pH drops in the stomach environment allows using lower doses to achieve high effectiveness. The Fenugreek extract contains 4-hydroxyisoleucine, which affects the insulin-glucose metabolism. Studies show that this compound can change the insulin activity by affecting the increase of its secretion and improve the sensitivity of tissues to its action, as a result of which it can counteract insulin resistance, help to reduce body fat and improve the energy regeneration of muscular tissue, whose energy reserves were depleted during a workout. It is also believed that 4-hydroxyisoleucine may have a beneficial effect on muscle saturation with creatine, which makes it a valuable addition to the preparation. Alpha-lipoic acid (ALA) is involved in the metabolism of the body causing an increase in energy expenditure, reduces blood glucose, reduces the aging rate of proteins and participates in the synthesis of acetyl-CoA, which is an important compound involved in energy production. Since the endogenous production of ALA is insufficient to fully cover the body's needs, its supplementation is recommended. It is believed that the supplementation of alpha-ketoglutarate (AKG) allows improving the top performance of athletes, while the manufacturers of ergogenic sports supplements claim that AKG can be an important support of the proper nutrition model of an athlete who wants to achieve the highest efficiency. This opinion arises from the fact that AKG can bind to ammonia, thereby reducing the problems associated with its excessive accumulation and toxicity. Ammonia is formed during the metabolic transformations of amino acids taken in the food consumed. When it is not properly metabolized it may accumulate and reduce the body's efficiency. Alpha-ketoglutarate is also used in medicine to reduce muscle breakdown after a surgery or an injury. In terms of supporting the physical effort, L-Leucine is the king of all amino acids. Contributing to the activation of the mTOR pathway, it acts as a factor accelerating the synthesis of muscle proteins. Leucine is the main ingredient of one of the most popular dietary supplements for athletes – BCAA. The addition of niacin and folic acid regulates the growth and functioning of cells, supports the metabolism of energy components and transformations aimed at releasing the energy, participates in the formation of red blood cells and has a positive effect on the entire nervous system and mental health. In conclusion, Scitec Crea Combat is a dietary supplement whose regular intake supports the rapid growth of muscles, improves energy production during physical exercise and increases muscle strength. The preparation is intended for both advanced athletes who want to improve their sports results, as well as amateurs whose aspirations do not go beyond the recreational aspects of physical activity. Take 5 capsules immediately after training. Take 5 capsules 30 minutes before a meal. On training days it is worth applying 2 portions, in the morning and after training. Taking before meals with high carbohydrates content may bring additional benefits. For best results, it is advisable to use for at least 8 weeks. Bovine Gelatin, Bulking Agent (Microcrystalline Cellulose), Anti-Caking Agent (Magnesium Stearate), Color (Titanium Dioxide). A multi-component preparation that facilitates carbohydrate metabolism and improved insulin sensitivity.